FGC BOLSA - FGC FINANCIAL MARKETS INFO: What's News: Homeland Security Chief Resigns; Netanyahu's West Bank Reversal; Memphis's Graceland Battle. What's News: Homeland Security Chief Resigns; Netanyahu's West Bank Reversal; Memphis's Graceland Battle. Kirstjen Nielsen quits as homeland security secretary. President Trump named U.S. Customs and Border Protection Commissioner Kevin McAleenan as acting homeland security secretary. Ms. Nielsen's resignation is another challenge for the administration as it grapples with its core immigration agenda while facing a surge of migrants at the southern border. Acting head played role in family separation. Mr. McAleenan has acted as an enforcer, though not an architect, of Mr. Trump’s often hard-line approach to illegal immigration, including last year’s controversial but short-lived policy of separating immigrant parents and children at the border. Pinterest to lowball IPO price range. Pinterest plans to set a price range for its IPO that is below where the online image-search company last raised money privately when it begins a roadshow today. Netanyahu’s West Bank reversal roils Palestinians. 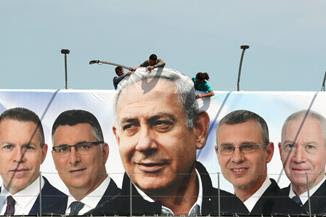 Prime Minister Benjamin Netanyahu’s pledge to extend Israeli sovereignty over parts of the West Bank provided another jolt to volatile relations with Palestinians in an 11th-hour bid to win right-wing support for re-election. U.S. pulls some troops from Libya. The U.S. military said it withdrew a small contingent of American forces from Libya as the country teetered on the brink of full-scale civil war. The evacuation is the latest turn in a troubled history of American military involvement in Libya, which has been in turmoil since the overthrow of Moammar Gadhafi in 2011. White House defends Herman Cain. Officials backed Mr. Cain for a seat on the Federal Reserve’s board of governors even after the onetime GOP presidential candidate warned that he expects renewed scrutiny of sexual-harassment allegations against him. Carlos Ghosn ousted from Nissan board. Shareholders voted to remove the auto maker's former chairman from the board, severing his final link to the company. The former executive is being held in jail until at least April 14 without possibility of bail after a fourth arrest last week on fresh suspicions of financial misconduct. Earnings season will test bull market. 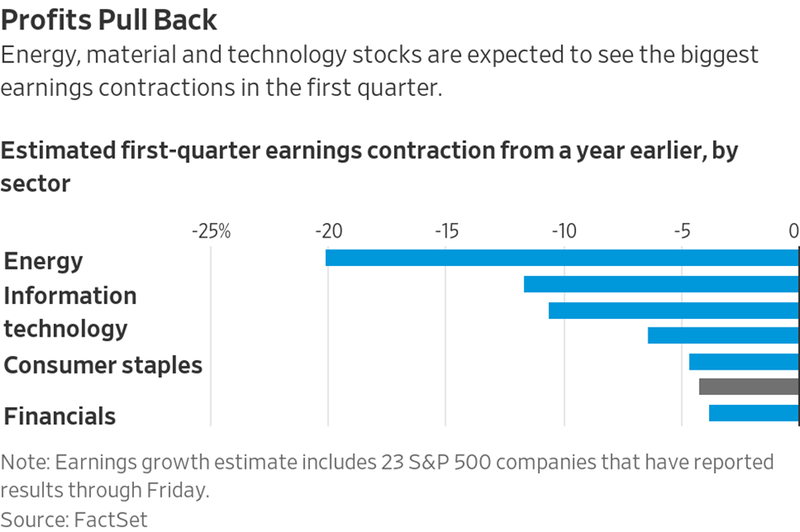 With earnings season kicking off and valuations creeping up to their highest levels in more than half a year, investors say they plan to scrutinize corporate executives’ comments to gauge whether the contraction in corporate profit growth is a momentary blip or further evidence of a late-cycle economic slowdown. China's hard edge. 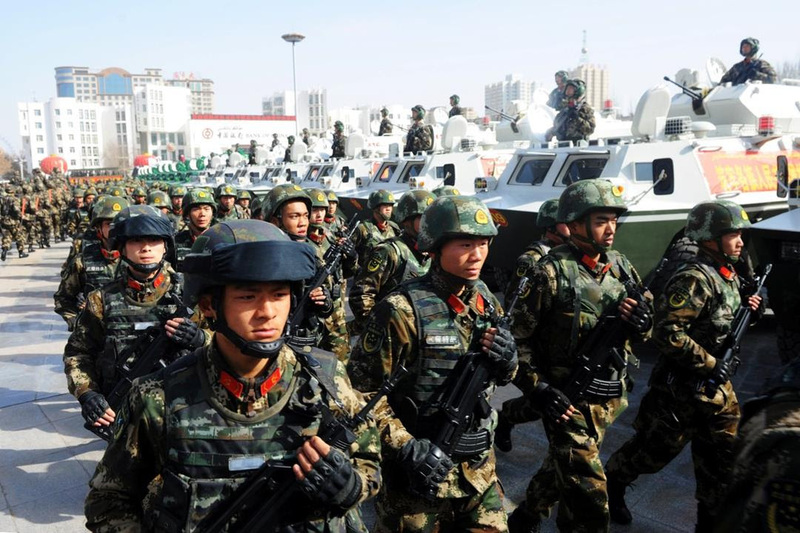 With high-tech police stations and re-education camps, Chen Quanguo—the official behind aggressive surveillance and social control in China’s restive Xinjiang region—is gaining prominence in Beijing, and his methods are spreading to other parts of the country. Amazon’s Alexa adds features to expand health tasks. The e-commerce giant wants its AI assistant to track consumers’ prescriptions and relay personal health information, in a bid to insert the technology into everyday health care. Amazon and health-care providers will collect some data to improve voice recognition and track consumer habits. Car dealers push extras even harder. Car shoppers headed to a dealership are in store for a hard sell on something other than a vehicle. As dealers’ profit margins on new-car sales shrink, they are relying more on extended warranties, paint-protection plans and other add-on services pushed by salespeople. Another week, another deadline for Brexit. Britain’s two main political parties are pushing to reach a new deal this week ahead of a European Union summit that will consider a request from British Prime Minister Theresa May to further postpone Brexit. The U.K. is formally scheduled to leave the bloc on April 12. 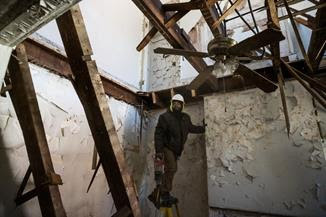 Baltimore's blighted houses get a new life. Instead of ending up in landfills or being pulverized, West Baltimore's century-old row houses are being reused in new buildings. The program is being trumpeted as a model and officials from other cities have come to look at how it works. Tips for using a Roth IRA to save for college. We asked experts to help answer more reader questions on the best way to save for college, including how to use tax-advantaged “529” accounts. Shockingly good smartphones for $350 or less. A generation of inexpensive phones has hit the market, writes the Journal's David Pierce, offering great performance, good battery life, attractive design and even some unique extras—for an experience shockingly similar to a $1,000 phone. Memphis offers to pay to keep Graceland. 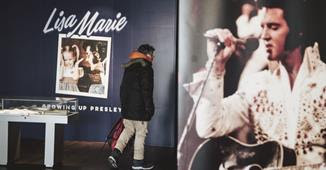 The city's council will vote April 16 to complete new tax breaks for Elvis Presley's home to fund a $100 million expansion, a peace offering in a two-year war that included threats of the estate leaving the singer's adopted hometown. March Madness wraps up. 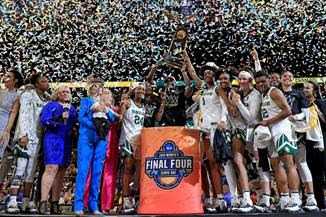 Baylor beat defending champion Notre Dame 82-81 to take its third women's title. Monday night's men's matchup pits No. 1 seed Virginia against No. 3 seed Texas Tech. There will be a lot of defense. And there won’t be many points, which is exactly how both teams like it. 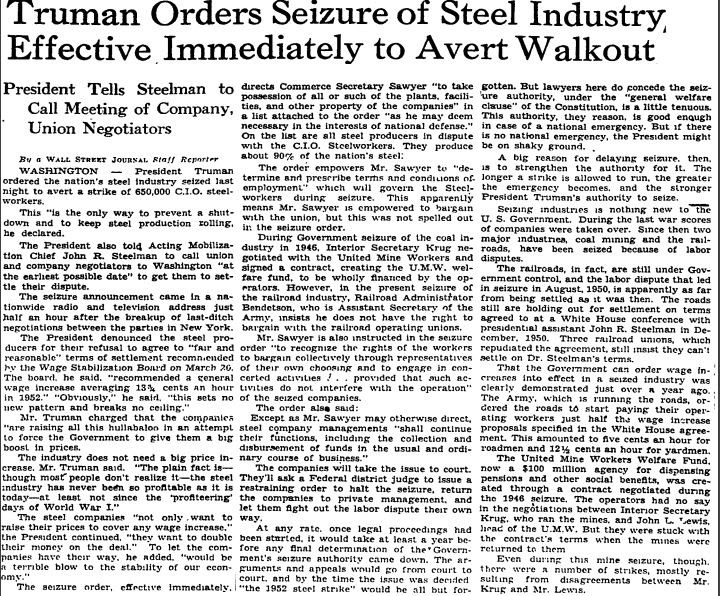 President Harry Truman issued an executive order to take control of America’s steel industry to prevent a strike over workers’ wages that would interrupt production. The steel companies sued to determine whether the president overstepped his constitutional powers. After the Supreme Court ruled against the president, the United Steelworkers of America went on strike, winning a wage increase in July the same year. —Compiled and edited by Josée Rose and Bryony Watson in London.